(CNN) -- There are a number of ways to measure the financial turbulence of the past year: the billions of dollars in public funds used to prop up banks; the cliff-drop in exports from any major economy; or the latest unemployment report. 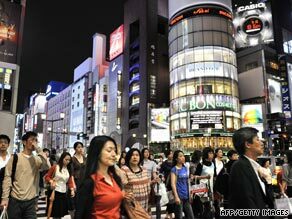 Tokyo tops the list for the most expensive cost of living. Another way to judge the financial volatility of the past year is the ranking of the most expensive cities for expatriate employees to live. The 10 most expensive cities for expatriates -- according to a cost of living survey released this week by Mercer International -- are: Tokyo, Osaka, Moscow, Geneva, Hong Kong, Zurich, Copenhagen, New York City, Beijing and Singapore. Although Tokyo typically ranks toward the top of Mercer's cost of living survey, the rest of the list saw wild jumps up and down. The reason? Wildly swinging currency values against the dollar, causing changes in the real cost of household expenses and other variables that companies factor when considering compensation for its overseas employees. "This is the first time we've seen tremendous fluctuation in the changing of the rankings," said Cathy Loose, head of Asia Pacific sales for Mercer, which analyzed the cost of living in 143 cities on six continents. If you're an expatriate worker paid in dollars while living in Warsaw, then the next round of Zubrowka vodka is on you. The drop in the Polish zloty against the dollar led the city to fall from 35th to 113th on the list. Meanwhile, the value of the Egyptian pound has rocketed Cairo to 57th place from 101st. Five of the top 10 cities were found in Asia, where currencies performed well against the dollar -- such as the yen, Chinese yuan and Singapore dollar. Hong Kong, ranked fifth, has currency that is pegged to the U.S. dollar. Unwinding of debts and repatriation of cash investments to the U.S. and Japan has kept the dollar and the yen relatively high during the crisis, says David Mann, senior FX strategist and head of research at Standard Chartered Bank Hong Kong. "Japanese and U.S. investors, in terms of their portfolio, are closing out major losses in the stock market," Mann said. "U.S. recessions are generally positive for the (U.S.) dollar." As a result, economies in the United Arab Emirates -- such as Dubai and Abu Dhabi -- shot up in cost of living rankings, because their currencies are pegged to the U.S. dollar. European cities fell steeply on the list, as local currencies weakened against the dollar. Glasgow and Birmingham saw their rankings last year (60th and 59th, respectively) tumble to 129th and 125th. Cities in Sweden, Ukraine, Czech Republic, Romania and Hungry all fell between 36 and 48 places. Cross-currency fluctuations can cause headaches for companies placing employees abroad, especially if the home-office currency -- usually used as the basis of the employee salary -- has dived compared with the currency of the country where the employee is based. "For example, the Korean won has depreciated quite a bit, and the (compensation) package in value has dropped significantly" for Korean expatriate employees working in nations with stronger currencies, said Loose. Cross-currency rates can be further complicated for expatriates if they have salary in a currency that's doing poorly but have debts in a currency that's strong. "For example, if they're working abroad but have a (British) sterling mortgage, or mortgages in the U.K. but took it out in yen," Mann said. "It's a further reminder for individuals to be careful about the (foreign exchange) market."